So this week Harry from Table Top Banter and me decided to try a little scenario that we have been discussing for a while, the idea being that you can attack your rivals base and pilfer some treasure. We were so impressed by how it turned out that we decided to commit the makeshift scenario to paper (virtual paper...) and share it with you lot! Please feel free to have a go yourself and if you have any feedback; we would of course be very keen to hear it. After employing some of the locals to studying the rival wizards base for weeks, the prime opportunity to strike presents itself! Your chance to get in while most of the warband are away on the wizards errands; Your chance to really get the upper hand. 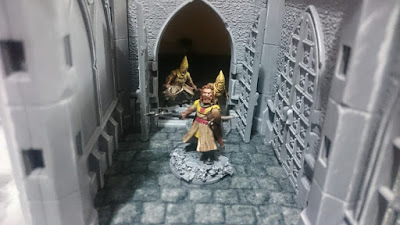 Place a doorway at the centre of one table edge; this is to represent the entrance to the defending Wizards, this can have defensive ruins and scenery to help the defending warband to defend the entrance. Lay out the rest of the table as per the rules for a standard game, including the placement of 4 treasure tokens. Before the game the players should chose who will be defending their base, they will begin the game with their warband off the table, the attacking player should deploy as normal on the opposite edge to the entrance. The Attacking player should Roll a D20 before the game begins, this will determine a number of the defending warband soldiers that are ‘off on errands’. This number is 2+ 1D4 (D20 Roll; 1-5 = 1, 6-10 = 2 etc.) This number of soldiers should be put to one side as they are considered to be elsewhere in the city. During the initiative roll on every turn; a roll of 1-5 by the attacker or 15-20 by the defender will bring one of the soldiers that was ‘off on errands’ back onto the table on a random board edge (follow creature spawn rules for this). All soldiers returning this turn will enter on the solider phase and will all enter on the same edge. This will continue until all of the soldiers ‘off on errands’ have returned. On turn 3 the defending warband that are in the base (those not considered ‘off on errands’) will enter the table through the base entrance on the phase that they are activated (e.g. a group activating Wizard may bring up to 3 soldiers onto the table in the Wizard phase) until they are all out of the base. The attacking player must spend an action touching the door (and not engaged) to get the special treasure token, this cannot be taken from the table on the board edge that has the base entrance. Treasure tokens cannot be taken from the table on the board edge that has the base entrance by the attacking warband, this restriction does not apply to the defending warband. The attacking wizard received an additional 100 experiences and d3 extra treasure tokens if they can take the special treasure token. One of the d3 will be an item from the defending wizards vault (chosen randomly).